Speaker Jammu & Kashmir Legislative Assembly, Kavinder Gupta and Member Parliament Jugal Kishore Sharma inaugurated two Pedestrian Subways one each at Gangyal and Digiana here today.The subway has been a long standing demand of the locals said the Speaker, inaugurating the 36 mtrs long subways constructed by PWD (R&B) department at a combined cost of Rs 2.5 crore under Centre Road Fund (CRF). The Speaker said that the use of the new subways will prevent accidents as these areas are prone to accidents due to movement of heavy traffic. Speaking on the occasion, Member Parliament Jugal Kishore Sharma said that new subways will be beneficial for the public, as they can easily go through underpass and it will also reduce the risk of accidents as the pedestrians now can easily avoid the heavy traffic to cross the roads in these areas. 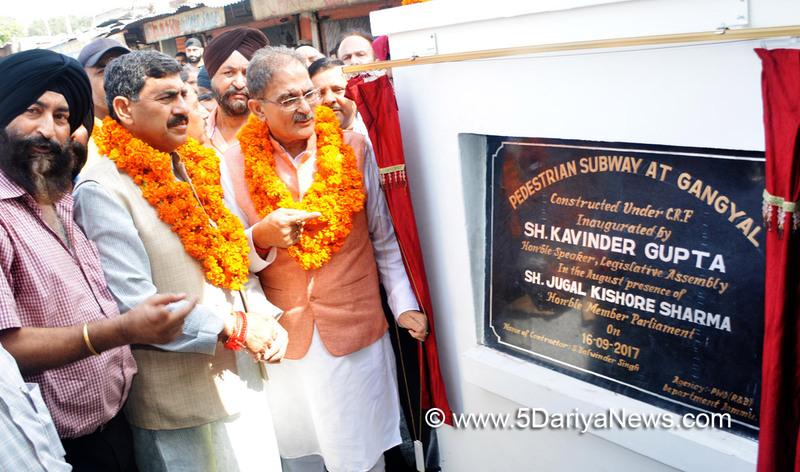 The Speaker directed the concerned officials to ensure the maintenance & cleanliness of these subways and also urged the locals to contribute their part to keep cleanliness in and around the subways.Speaker said that the government is commitment to provide all basic amenities including better connectivity to the people for which various road projects have been taken up.Kavinder said that mega road project from Kunjwani to Satwari is at finishing stage and will be completed by December. It is the priority of Government to provide better road connectivity, the Speaker added. Emphasising on agenda of development, the Speaker said that strenuous efforts are being made for the development of Gandhi Nagar constituency and assured that more development works will be taken up for welfare of the locals.The residents of Digiana also apprised the Speaker with their demand for upgradation of road in their locality. The Speaker assured them that all their genuine demands would be looked into on priority and directed the concerned officials to take necessary measures in this regard.Senior Functionaries of R&B and other concerned departments besides senior leader Baldev Singh Biloria and prominent citizens were present during the inaugural ceremony.Later,Speaker, Legislative Assembly, Kavinder Gupta and Member Parliament Jugal Kishore Sharma distributed LPG connections under Pradhan Mantri Ujjwal Yojana (PMUY) among BPL beneficiaries at Bawe.Highlighting the objectives of PMUY, Speaker said the scheme aims to safeguard the health of women and children by replacing the unclean cooking fuels, mostly used in rural India, with clean and more efficient LPG.Stressing on women empowerment, Jugal Kishore said that the gas connections are issued in the name of women of the households to ensure women's empowerment especially in rural areas.